I'm surprised we haven't seen any statue/figurine images yet. Being able to add AtLA/LoK figurines to my collection would really get me. I collect the odd Disney Infinity figurine here and there, and I don't even play the game. There's been LoK merch on the Nick site of this nature ever since Book 1. Shirts, plushes mugs, mousepads, stuff like that...it's already been out there. Of course, Dark Horse has a good track record with managing properties, so whatever they put out might be a bit more interesting, but...lunchboxes? Eh, at least the shot glasses are acknowledging the older fans, I'll give them that. 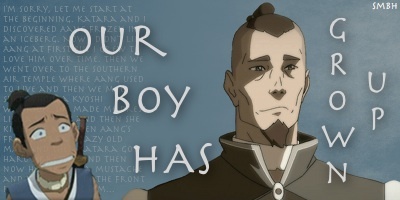 Nick seems dead-set on the idea that Korra is a teen-only series for some reason. The orange theme of the shot glasses is actually in line with a number of Korra-themed stuff from Book 1. 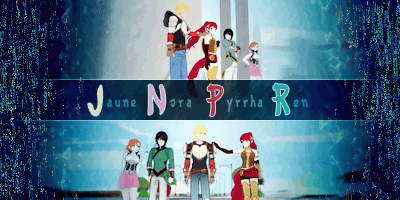 The marketing style of the commercials, official merchandise, and even stuff like a PSN Theme all used that orange/black style to them, at least during the first season. I'm not sure what the thinking was, though. As for the video games, I've played a couple -- they actually were all right. The Burning Earth on the DS was an isometric action RPG with nifty little sprites (and a surprisingly accurate recreation of the Beifong Estate, amongst other things), and Into the Infero on the Wii had the actual cast from the show doing the voice acting, and used the Wii remote's pointer to manipulate elements to solve puzzles. The DS version of Into the Inferno was a totally different game with a chibi art style instead, and played kind of a combo of the other two (you used the stylus to manipulate elements). Nothing mind-blowing, but Into the Inferno in particular was very similar to the Lego games with the co-op/multi-character dynamic to it. I specifically enjoyed the writing/voice acting of the Wii version as it took elements from the show and made them work in a video game (Samurai Momo was the 'tutorial' character, Doc/Shu was the guy who ran a shop where you spent your game currency), and it was just kind of neat to play like a remixed, watered down story of Book 3 but with 'new scenes' in a sense. For ex. when you fight Combustion Man, you play as Sokka and Toph, and they spend the whole fight ranting back and forth as to what 'nickname' to give the guy -- the writing and acting felt in-line with the show, so it was cute. I haven't seen anything beyond flash games for LoK. Nick probably won't fund a full retail game or even a downloadable, smaller scale game with that series because, yes, game publishing/development is extremely expensive these days, and Nick has not been as risky as it once was. In the same way Mass Effect fans want to forget the ending of ME3 happened, so, too, do I wish to forget about 'Harmonic Convergence.' >_>; If we got a LoK video game, I'd rather it just not even try to go over the story and be all gameplay but with the flavor of that world. A pro-bending video game would actually make sense, be something non-Avatar fans could get into (which could lead to them checking out the show), and serve as a non-serious game where you could toss in AtLA characters for kicks -- sort of like the Mario sports games have with Final Fantasy characters, for example. Anyway, back on topic with Dark House stuff, specifically, if this is all hitting in May at the same time or something, I'm shocked we haven't seen anything yet outside of a lunchbox and some shot glasses. A Book 2 OST and an AtLA OST seem like no-brainers, and I can't help but wonder why the heck that stuff hasn't happened yet, if only in a digital release format. But Nickelodeon doesn't make any sense to me anymore -- and to be fair, Mike and Bryan don't anymore, either. ^_^; But Dark Horse I trust, so fingers crossed that we'll get some nifty stuff spanning both series. And yes, for the love of all that is good, where are the LADY figurines already? Preview of the new merchandise at SDCC 2014. I don't think that orange vest is official merc though. Must be a random picture of a cosplayer? 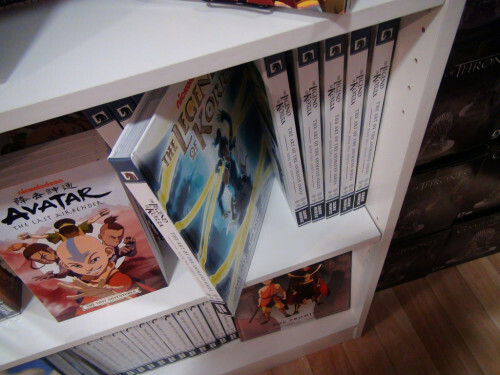 ^ I want that Aang statue. Oh yes please. To all of that (except maybe the lunchbox)! I love the Aang statue and the Kataang family photo. Also, does that say there will be both "standing" and "sitting" Naga plush animals? Seems a bit unnecessary, but welcome! The Book 2 art book is out early at SDCC but do we have to wait till Sept for the general audience?? Goodness! I really want that merch! I'd totally sew that Fire Nation patch onto a jacket, backpack, or ammo pouch, though I do wish it were crimson red and not orange. The Amon t-shirt actually has a really cool design. I'd wear it. Can anyone confirm if the Kataang family portrait is being sold at Comic-Con? It's on display at the Nickelodeon booth too. EDIT: And it seems it is. I must find a way to get one!!! Thanks for the information! Scalpers are seriously the worst. Stinks that it was only sold at the convention though. The prints from the last two Comic-Con's were sold on Nick's website too. ^ Yeah. Signed and unsigned posters going up for USD$500 on eBay. I like the shows but eh, I'm sure we can print the picture ourselves at a much lower cost. Anymore info about that Aang statue? I hope that wasn't just a SDCC thing for decoration. I want that thing mass produced so it can be MINE! But only through official sources. I don't deal with scalpers and whatnot on Ebay. Dark Horse should make it available for 3D printers. Thanks for the info. It's good to know it's coming at least. When I looked on The Dark Horse website all the future merchandise showed at the convention had a release date, but the statue was nowhere to be seen. Here's hoping it's coming in early 2015. I'm gonna be buying a house early next year so I want it released before I become broke lol. They recently made the Family Portrait available on the Nick Shop. I hope you guys are able to pick one up! You are officially my best friend. 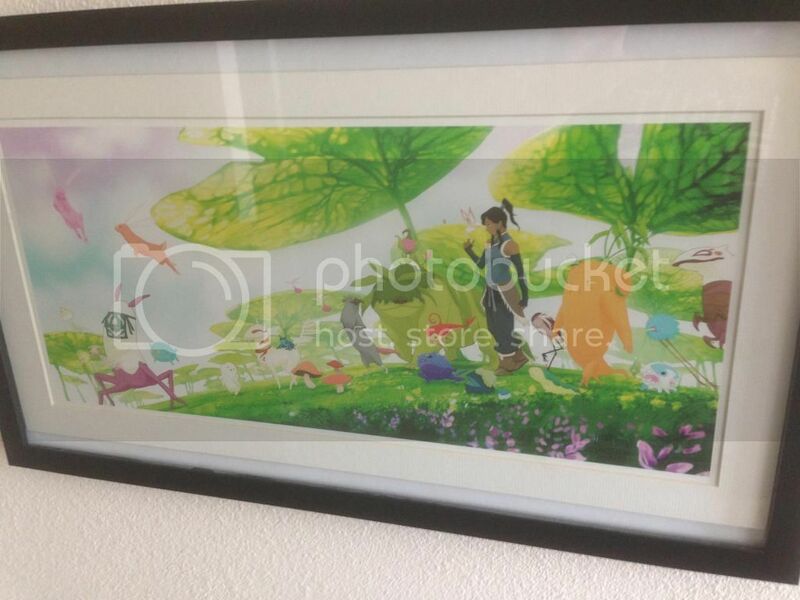 Ordered the print and it's on it's way to me! Man that is expensive but I really want to get one. Is this a limited time thing? Unframed?! Wow, now I see how Nick plans to make LoK profitable. Cater to a small fanbase with wildly overpriced merch. Seriously, why is it 60 dollars? Is there something about it that I don't know. It's limited in quantity (in other words, don't delay purchasing it too long if you intend on getting it) and based on past art prints done in this process they describe (Giclee) the results are quite beautiful and look the same on a wall. I'd say, personally, $60 is easily a good price for the quality of the item. Sounds like a big poster to me. Question is whether the material of this would be soft and flimsy. I bought this TV poster on Amazon years ago and even with lamination, the poster still curled and furled at the corners. Meh. If the past prints are any indication, the portrait ships flat in it's matte border so it won't curl unless one intentionally does so.